Which camera strap should I get? Your new F1 will be more pleasant to use if you do a quick “break-in” before installing it on your camera. Adjust the strap from minimum to maximum length about twenty times, by holding the end and pulling on the adjustment tab. That should do it. The flat mount version of our F1 camera strap installs similarly to a “traditional” camera strap, with a significant difference — the sliplok and keeper are used only for installation, not to adjust the length of the camera strap. Situate your F1 so the adjustment tab is in front of your body when the camera strap is fully-extended, and the camera is worn sling-style. 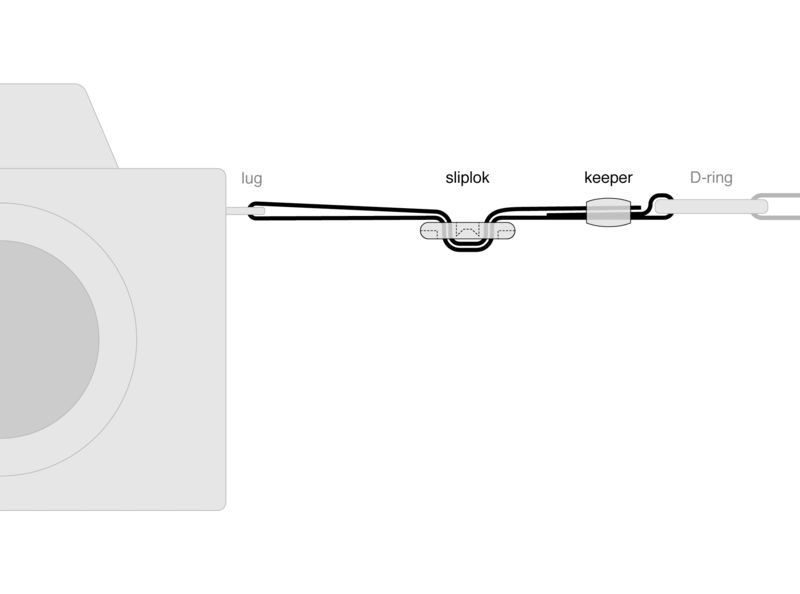 Feed the webbing once through the keeper, then the sliplok, as shown. Insert the webbing through the lug, far enough so the webbing can double-back along itself. The webbing loop will be about 6″ (15cm) long. Feed the webbing back through the sliplok, then the keeper, as shown. Cinch the keeper close to the D-ring (push it past the stitching that holds the webbing together). This will keep everything nice and neat, with no stray webbing anywhere. Which strap should I get? Copyright © 2019 Simplr LLC. All rights reserved. Prices displayed in US$. …and that’s a promise. We only send new product announcements & occasional special offers.